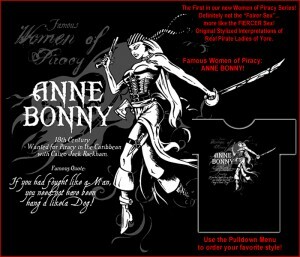 Anne Bonny, Where Ya Been All Me Life? PirateMod has long been known for making incredible, original pirate Ts, but once in a while they crank out a design so remarkable it bears special mention. 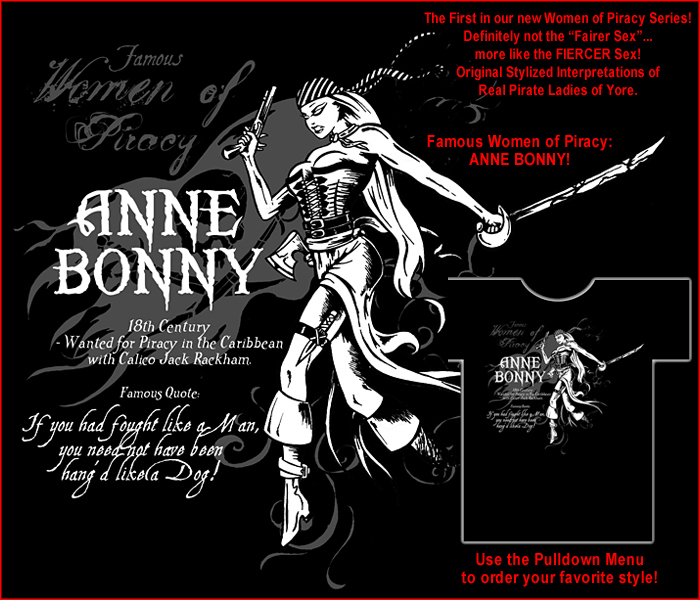 Their new “Anne Bonny” shirt is one such design. I don’t know what it is – the heaving bosom, the long slender legs, or the undead, soulless eyes – there’s just something intriguing about this lass. It’s actually the first in a series on Famous Women of Piracy, so keep an eye out. This entry was posted in News and tagged anne bonny, piratemod by Bilgemunky. Bookmark the permalink. Aye Blige, I vote for the heaving bbbuuuzzzzums as a good reason to like this shirt! I’m talkin’ me own wench into wrappin’ her’s in one of these fine creations and then goin’ out on me boat in rough seas! Sorry Bilge, but I have now been waiting almost 2 full month and have NOT HEARD A WORD from pirate mod on my order. The money have been taken from my bank the day after I ordered, No Word from them – I waited a month and wrote them a polite inquiry and 2 weeks later – NOTHING – I sent 3 more very polite e-mails asking about my $75 purchase – its been over a week again and STILL NOTHING!?! So – Have I been ripped off? Is my stuff back ordered, discontinued – WHAT? Now I am about to drive up the coast and let them meet one angry pirate!